Mollie Cox is a Marine Conservation Campaigner, a Yoga Practitioner and a 590 Hour Registered Yoga Teacher. She draws from the methods of Ashtanga, Iyengar and Hatha Yoga, as well as teaches Meditation and Pranayama. She is based in Burleigh Heads on the Gold Coast for most of the year. When she is not here, she is in India assisting her teacher Yogacharya Lalit Kumar in facilitating Teacher Trainings, or practicing with her teachers Mark Robberds + Deepika Mehta. Mollie has been practicing Yoga since the age of 15, however intensified her learning in the Ashtanga method from the age of 21. She has travelled to India to learn about the ancient practice of Ashtanga Yoga with her teacher Yogacharya Lalit Kumar. The lineage of her teachings includes Sri K Pattabhi Jois, Sharath Jois, BKS Iyengar, Swami Veda and Swami Rama. 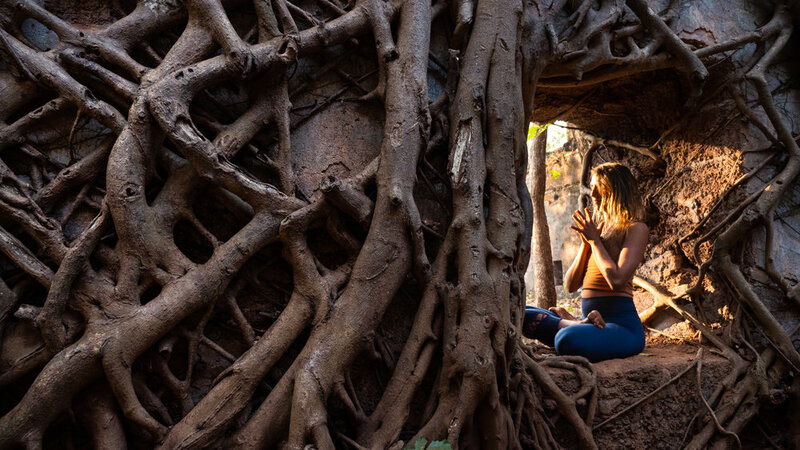 After studying Ashtanga Yoga in India, and learning the philosophy of the Patanjali method from her teachers, Mollie ensures that each class she teaches she imparts some of this ancient knowledge she has been blessed to have learnt, and shares her experiences of how to apply it to a modern world. She believes that by learning to apply the ancient physical and philosophical practice of Yoga to our day to day lives - the world will become a brighter, healthier, balanced, and a more sustainable place for ourselves, our families, our planet and for future generations. Mollie teaches a traditional, philosophical, light hearted class that is accessible to all levels of practitioner. Her aim is to hold space for each individual and meet them wherever they are at in their own practice. She specialises in Yoga for Mental Health and has extensive experience in the mind-body connection, and the purification process that Yoga starts, therefore has the ability to hold space for her students through the myriad of emotions Yoga exposes us to in a kind, gentle and loving way. Her passion lies in working one on one with practitioners to deepen their understanding of how Yoga applies to them as an individual on a physiological and therapeutic level, and empowers her students to cultivate a self practice and become their own teachers. She regularly holds events and workshops revolving around Marine Conservation and the practice of Yoga Asana and Philosophy, as well as teaches regular weekly classes around the Gold Coast. Mollies vision is to use Yoga as a vehicle to empower individuals to reconnect to themselves, so that they can connect to others and cultivate a community that is actively taking steps to unite and create a world where the human race can live in harmony with one another, other living beings, and our earth.